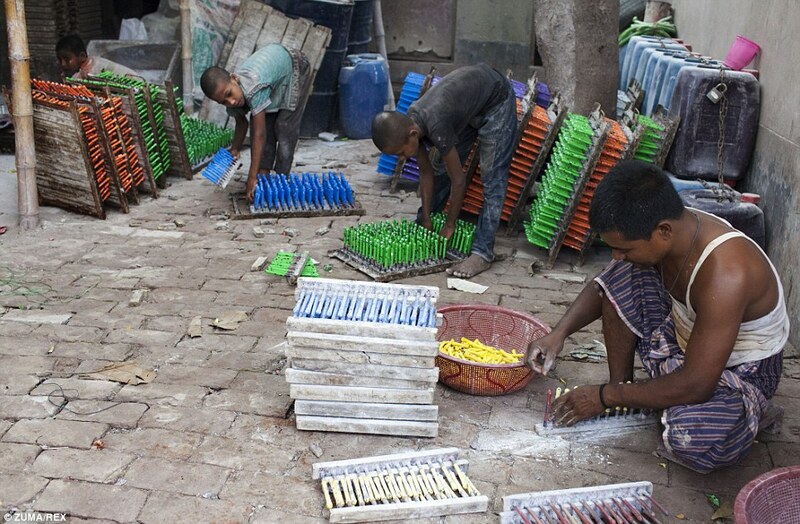 Caked in dust and wading through recycled plastic, these are just some of the thousands of children who work illegally in Bangladesh. More than a million children are involved in dangerous work in the country – despite the minimum working age being 14, according to the International Labour Organisation. 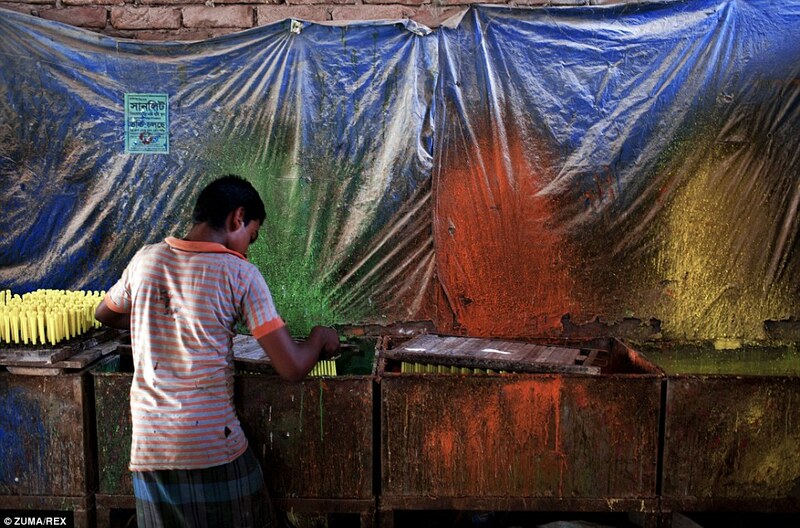 These compelling photographs were taken in the capital, Dhaka, a city where one year ago a garment factory collapsed killing more than 1,100 people. 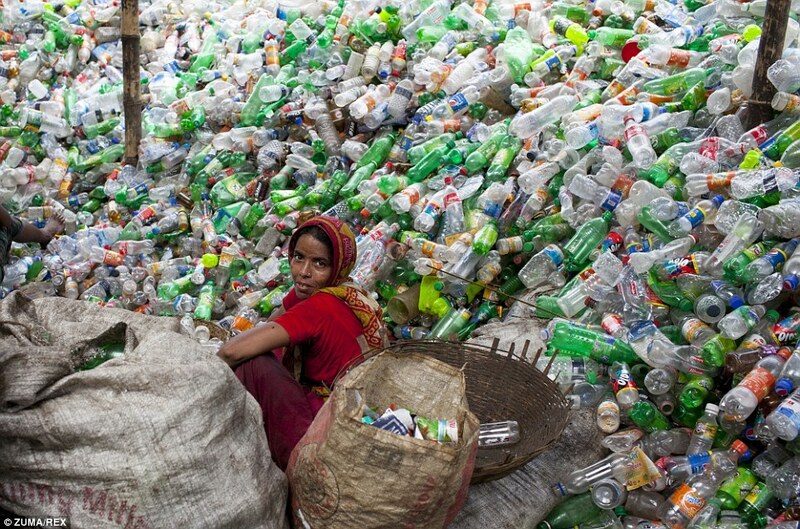 They show children working with their parents in a recycling plant and a balloon factory – hunched over moulds, spraying coloured paint and filling bags with plastic bottles. 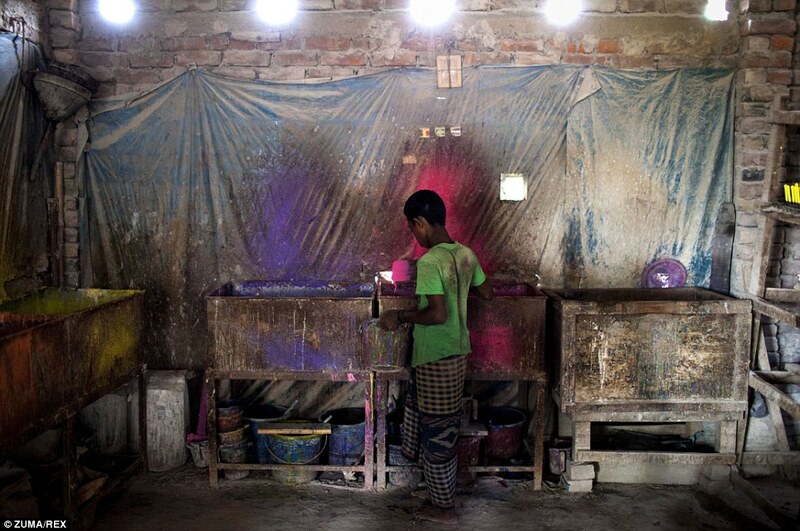 Despite a wave of new support for factory unions in the wake of the collapse of the eight-storey Rana Plaza building last April, which killed 1,135 on the outskirts of Dhaka, many people still work in dangerous conditions. In the ready-made garment sector alone, some $24million has been put towards new safety measures by the UK, U.S., Netherlands and Canada. There are already 392 more government inspectors than this time last year. 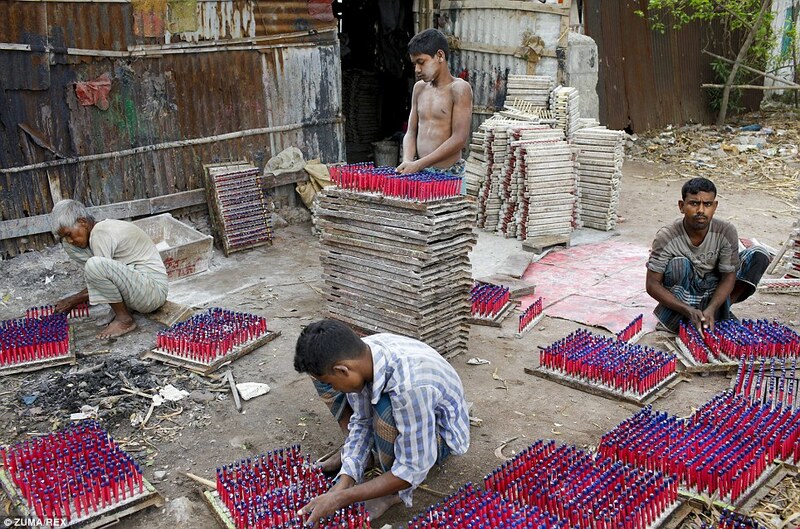 But many child labourers in the country slip under the radar, according to observers. 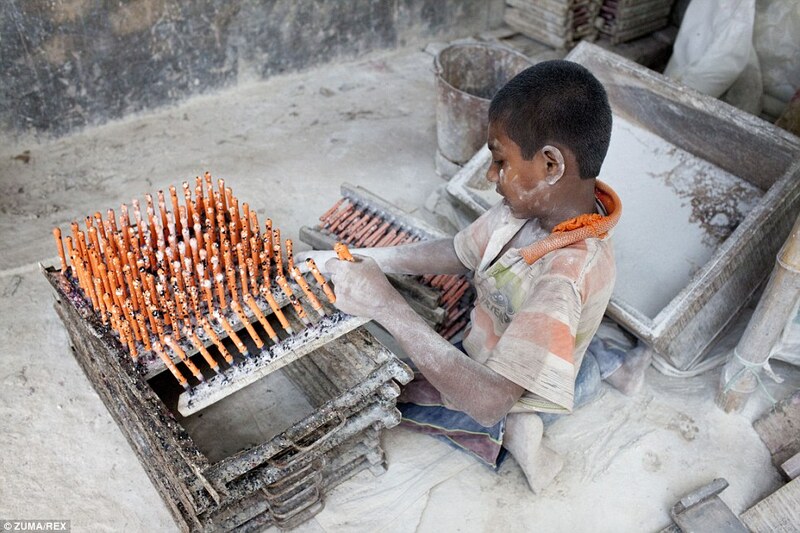 One group, the International Labour Organisation, says at least 7.4million children aged 5 to 17 are involved in economic activities. Of those, 1.3million are involved in hazardous work. 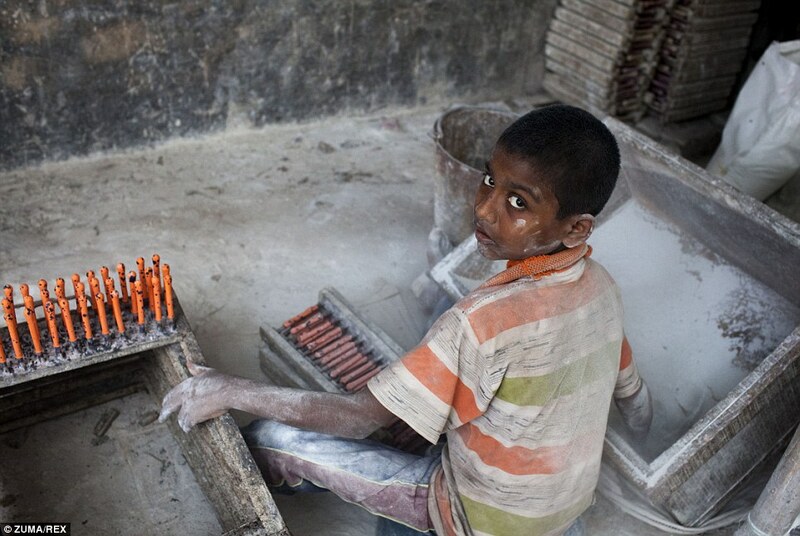 The minimum employment age is 14, but 93 per cent of child labourers work in small factories and workshops which allow their employers – or parents – to slip them under a radar, according to Unicef. 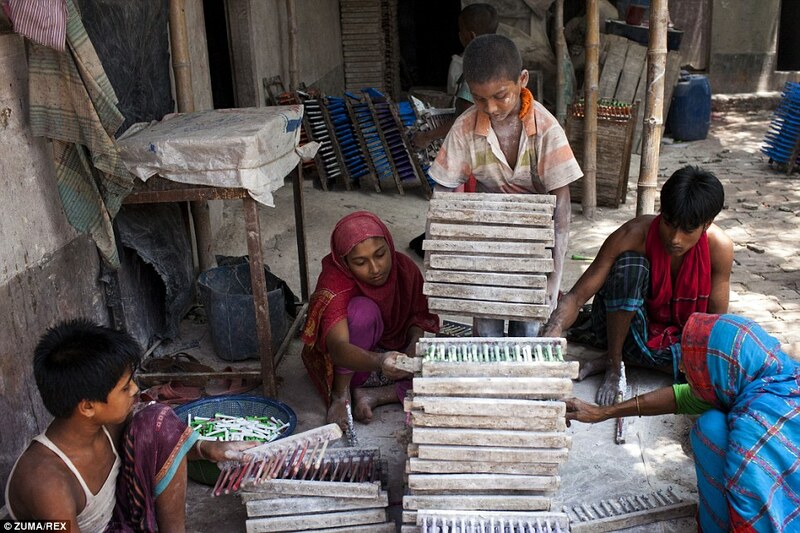 Poverty often forces families to send children to work in jobs like brick-chipping, construction and waste-picking. Even though the minimum wage is around $66 a month children are paid less than adults, with many working up to twelve hours a day – often preventing them from attending school. 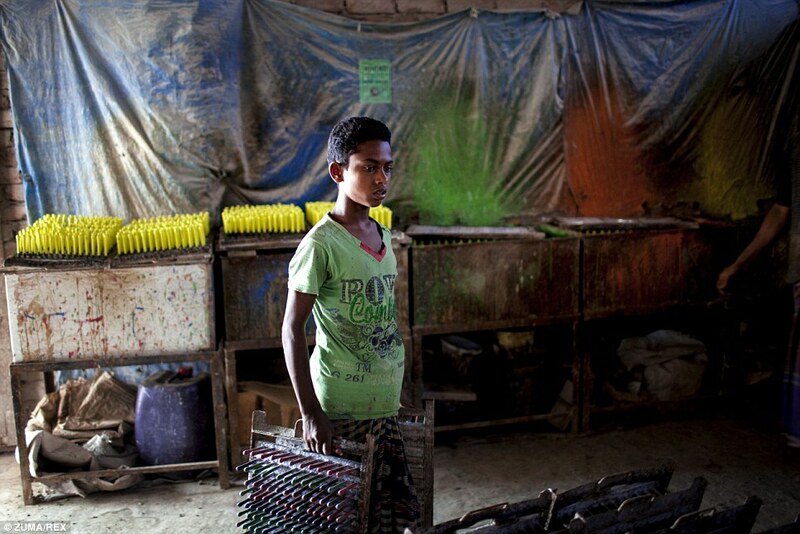 In Dhaka alone, an informal survey found 4,000 children working in more than 1,000 types of dangerous workshops or factories. 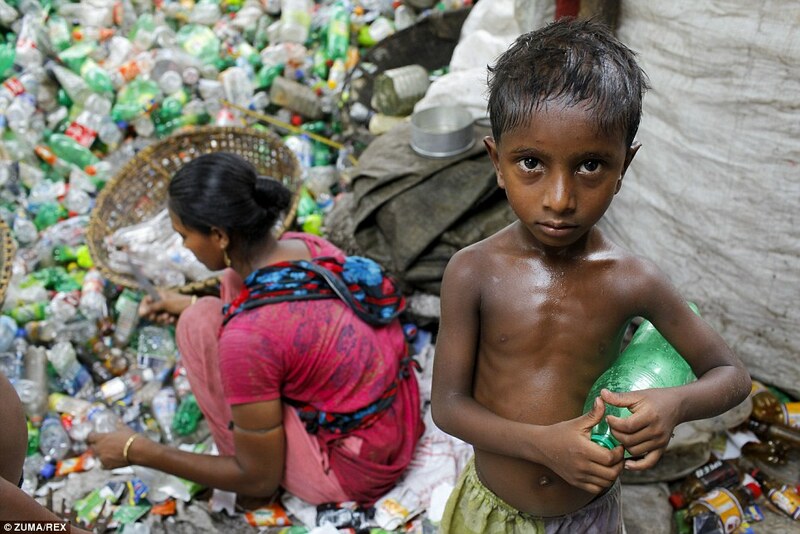 A Unicef statement said: ‘Long hours, low or no wages, poor food, isolation and hazards in the working environment can severely affect children’s physical and mental health. 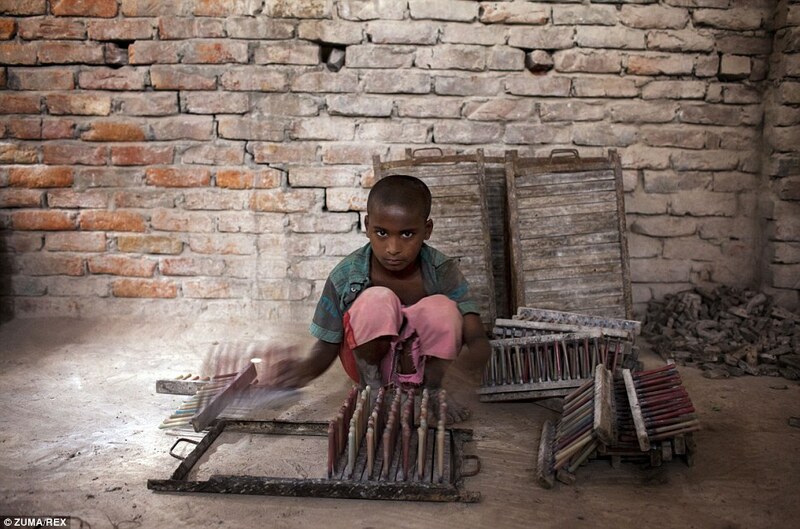 ‘Child labourers are also vulnerable to other abuses such as racial discrimination, mistreatment and sexual abuse. 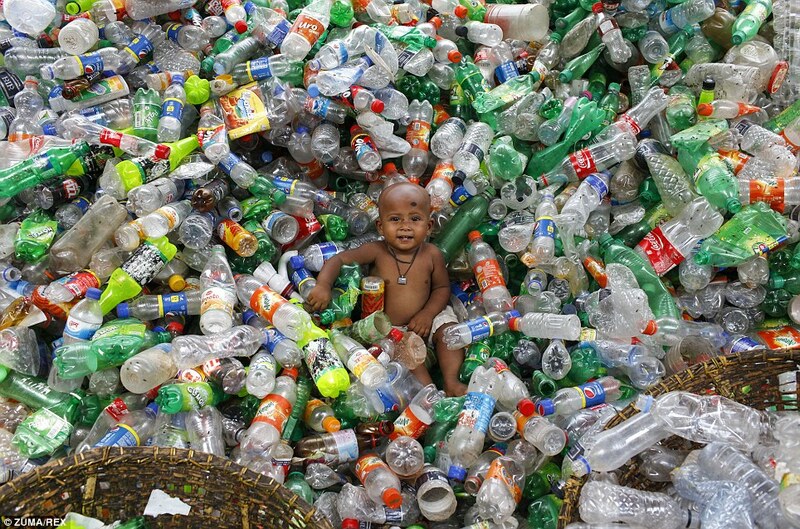 Some children work on farms, where they use dangerous tools, carry heavy loads and spread harmful chemical pesticides. 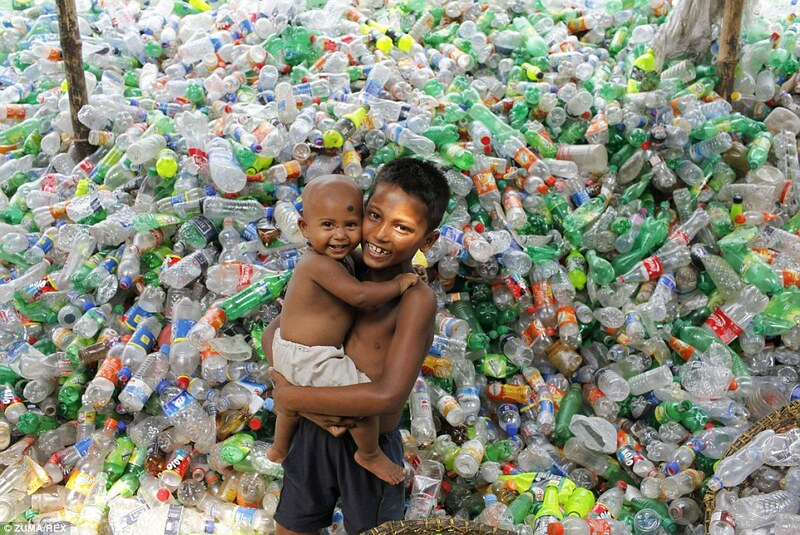 In a country with little medical care, they can end up with back injuries, infections and repetitive strain injuries before they have reached adulthood. Many girls, meanwhile, work long hours as domestic servants and are subject to discrimination, harassment and sexual abuse, according to the U.S. government. Most of the dead were adults last April when the Rana Plaza building crumbled to the ground, in what became the deadliest accidental building collapse in modern history. But not all were. Last week, as relatives of the dead gathered in their memory, Aanna Khatun revealed she was just 13 when she was rescued from the building. Surrounded by dead colleagues, she survived trapped in an air pocket between blocks of collapsed concrete. The owner of the illegally constructed Rana Plaza building is behind bars, pending an investigation, but there has been no word on when he will be put on trial. The owners of the five factories operating inside the building also have been detained. But problems remain. 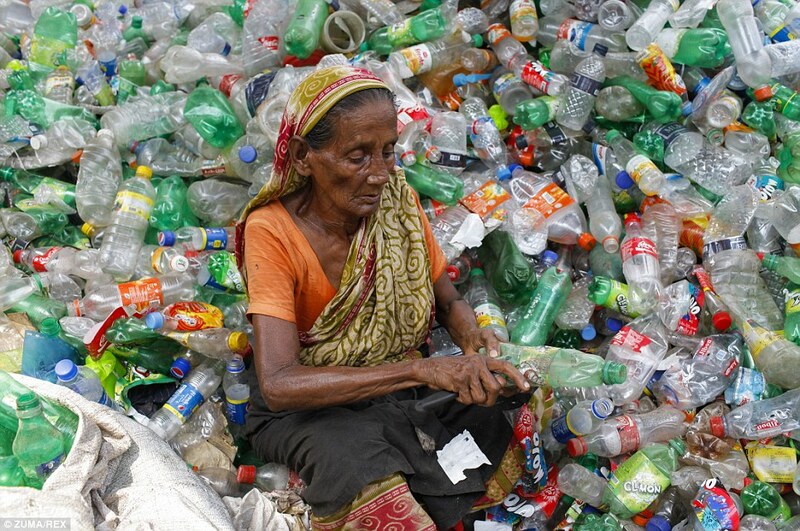 Observers claim the international companies which used clothes made in Rana Plaza are not contributing enough to the trust fund for survivors and victims’ families.